The internment of Marian Price, like the internment of Martin Corey has demonstrated further divisions in the criminal justice system in British Occupied Ireland, following the devolution of policing and criminal justice, after the Hillsborough Agreement of 2010 part of the Peace Process..
Marian's case demonstrated the ongoing power of the English Viceroyal for British Occupied Ireland in matters of social control and in controversial cases such as Martin Corey. The reliance by the British on closed material procedures in alleged terrorist cases is simply internment without trial and of particular concern to human rights groups, in that the Parole Commissioners, are not members of the independent judiciary in British Occupied Ireland but are British appointed officers, who were the internment agents determining the conditions. The role of the Parole Commissioners in Marian and Martin's case and their accountability and authority should have been put to the scrutiny of the Political Assembly Justice Committee along time ago. The Parole Commissioners in effect gave authority to the decision of a judges made years ago that Marian Price and Martin Corey should be released on bail pending investigations of the PSNI. It was these decision that the the Viceroyal for British Occupied Ireland ignored in evoking dictatrial powers in relation to categories of individuals released or interned on licence, thereby undemocratically, directly interfering with the indepedence of the judiciary of British Occupied Ireland who ruled years ago, that both Marian and Martin Corey should be released. 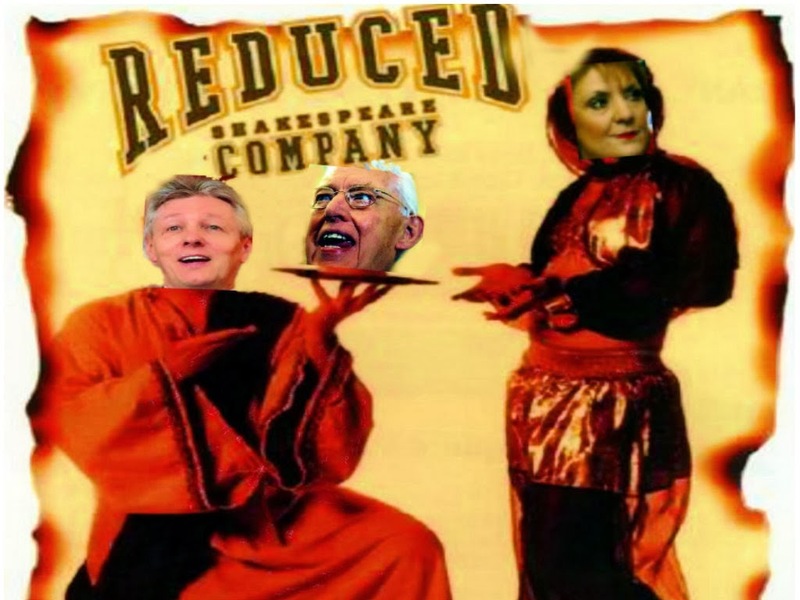 The powers that could have released Marian Price on compassionate grounds, were not exercised, by the supposed Minister of Justice, who misled the Assembly and the public, after being bullied by MI5 and sectarian power brokers in the Assmbly. David Ford therefore has and is exacerbating the medical and psychological conditions of both Marion Price and the elderly Martin Corey as their internment prolonged.without charge or time frame is torture. Rights Watch (UK) while welcomed the release of Marian Price from internment. The treatment of Marian and Martin amounts to interment without trial, enforced by the British on the nationalist community in Ireland. Both were held purely because of their political views. They are selectively targeted because they refuses to remain silent in the face of British repression. The British injustice system’s mistreatment of Marian and Martin has again exposed it as the disgraceful, hypocritical and supremacist structure that it is, a fact that Irish people have experienced throughout the colonial occupation of Ireland.Martin and Marian’s case reveal the utter contempt the British judicial system has for due process. 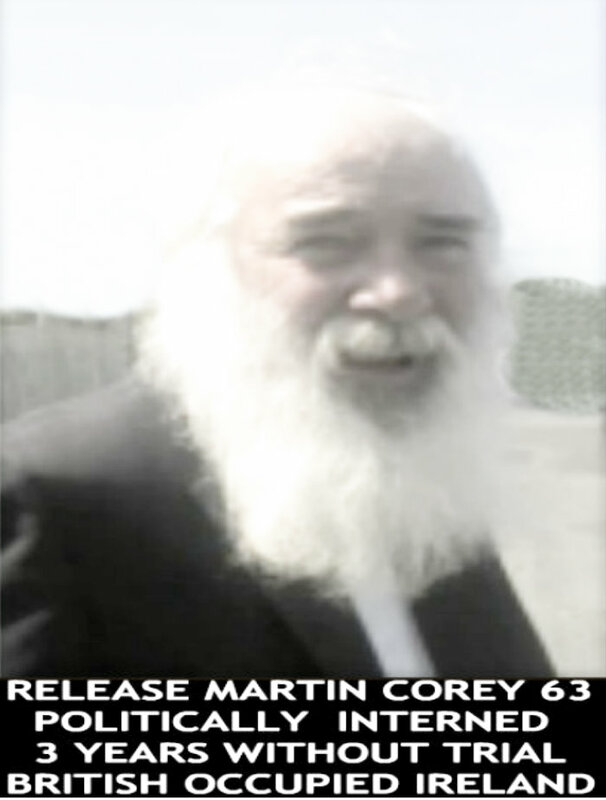 Martin Corey's human rights are being grossly violated by his long-term internment. He is effectively interned without trial, sentence or release date. This means he could be held for an indefinite time, an illegitimate procedure that allows the British administration to hold and elderly man for the rest of his life. On the basis of legal, civil and political rights, and those of peace proces, common sense, Martin Corey should be released immediately.